Who to hire first: Mortgage broker or loan processor? This has been a good year for the non-banks. With the banks tightening their lending policies and practices as a result of intense government and public scrutiny, alternative lenders have welcomed an uplift in business. As the non-banks are exhibiting more flexible lending policies and stronger appetites for near prime, alt-doc, investor and foreign borrowers than the banks, brokers have inevitably been sending more clients their way. And, for the most part, brokers say their clients seem open to these alternatives, despite their higher fees and interest rates. Overall, our survey suggests brokers’ recent experiences with non-banks have been positive, although some say there’s still room for improvement, especially in regard to turnaround times, BDM and credit team support, education and brand awareness. Nevertheless, this year’s top 10 non-banks all scored above 3.00, making it a higher pool of rankings than last year. The winning nonbank’s score last year, 3.51, wouldn’t have qualified it among the top three this year. But it’s not totally fair to compare – last year, the royal commission was but a vague threat on the horizon. With this now a reality, non-banks have been able to cast themselves as ‘coming to the rescue’ in this time of lending unease. And they could end up as the biggest winners of them all. However, as one Sydney broker put it, while non-banks will no doubt benefit from the major banks’ credit control, they need to “seize the opportunity wisely”. In order to achieve sustainable growth, she said they must improve lending capacity to maintain healthy service levels; establish “genuine relationships with broker partners” and not just ‘cash out’ on the situation; manage out-of-cycle interest rate rises and plan strategically for long-term growth. As their main conduit to customers, brokers hold a lot of influence over nonbanks. If a non-bank wants to expand its reach and be top of mind with brokers and their clients, it should heed brokers’ suggestions, compliments and complaints. Brokers rated each non-bank they had dealt with from 1 (very poor) to 5 (very good) across 10 categories of service. 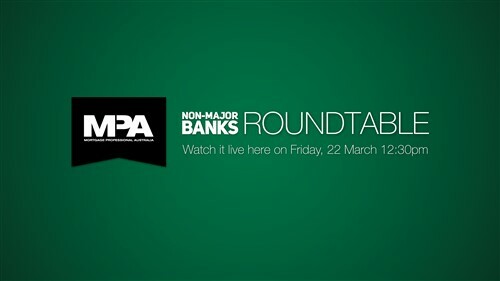 The non-bank with the highest average rating won the award for MPA Non-Bank of the Year. We also asked brokers which individual non-bank product was their favourite and which non-bank was their preferred lender in a variety of niche areas. The most-picked non-bank for each category was named the Preferred Lender. This has become the standard formula: the regulator applies macroprudential measures to dampen the major banks’ lending growth, thus allowing the non-bank sector to flourish. “This substitution effect has been found to be stronger in countries where there is a greater reliance on lending from the largest banks,” the RBA wrote in September 2017. Over the last few years, this has played out in Australia. In 2014 and 2017, APRA introduced benchmarks for investor lending, and then limits on interest-only lending. With greater focus on sound lending practices, ADIs began pulling back on lending to foreigners and their appetite for property development lending was reduced, leaving a gap for funding alternatives. Non-bank lending is estimated to be around 7% of the total financial system today, which is a far cry from the 15% market share it retained in 2007, according to RBA figures. While the non-banks’ market power is still miniscule compared to the mainstream banks, it is a sector that’s gaining increasing attention, especially from brokers with non-conforming and near-prime customers. As lending standards tighten, brokers have seen a shift in their business flows. Nearly 70% of our respondents said they’d sent more loans to non-banks in the last 12 months compared to the previous year. A quarter of respondents said they put between 41 and 80 loans through non-banks in the last 12 months. “I believe the non-bank lenders are a mortgage broker’s only solace in the current credit environment. They are the last bastion of help for those clients who are a ‘round peg’ for what appears to be a ‘square hole’,” said a broker from Victoria. Non-banks have also expanded beyond their usual fare of non-conforming and alt-doc loans and have gained ground in the housing investment and interest-only mortgages domain following APRA’s caps on the banks. Investment and interest-only loans accounted for almost 35% and just over 25%, respectively, of all loans originated by non-bank lenders in Q3 2017, according to Moody’s Investors Service. While the non-banks’ push into this area has attracted several benefits, such as private equity investors acquiring three non-bank lenders in less than a year, growth and competition could also put a strain on their small underwriting teams and prompt them to explore riskier segments of this market, Moody’s said. Some brokers in our survey noted that, in order for non-banks to secure their loyalty, they needed to add to their BDM and credit assessment teams to meet the rise in loan volumes, “otherwise they will lose traction with poor servicing and turnaround times”. Brokers are turning to non-banks primarily because they take a more holistic approach to their clients’ credit history and they’ll accept a wider variety of clients than the banks. “The good thing about non-banks is that they are still open for business and are willing to assess a deal on individual merit rather than credit score,” said one broker from Victoria. Several brokers said they appreciated the educational support provided by non-banks. “The non-banks are clearly and genuinely finding ways to approve reasonable loans for clients who have just been affected by life’s events and need a new start, and without making it more onerous to complete paperwork. Many banks say they are ‘for the broker’, but there’s always a new process and a maze of requirements to navigate, which makes you question this closely,” said a broker from Queensland. As open for business as the non-banks seem to be, brokers said one of their key challenges was helping clients understand why they didn’t fit with one of the bank brands they were most familiar with. “In order for our clients to use nonbanks more, there needs to be more awareness of their brand,” said a broker HIGHLIGHTS: PRODUCTS AND BRANDING from Western Australia. “I can say to a client that a non-bank is a great option for them, but if they don't know the brand it makes choosing them more difficult.” And that broker is not the only one to complain about this. A lack of brand awareness and the high prices of non-banks are still the biggest deterrents for brokers and their clients. “Some non-banks could do more around brand and tools for brokers, and investing in technology platforms, including phone apps. Most clients want this and it is the key barrier. 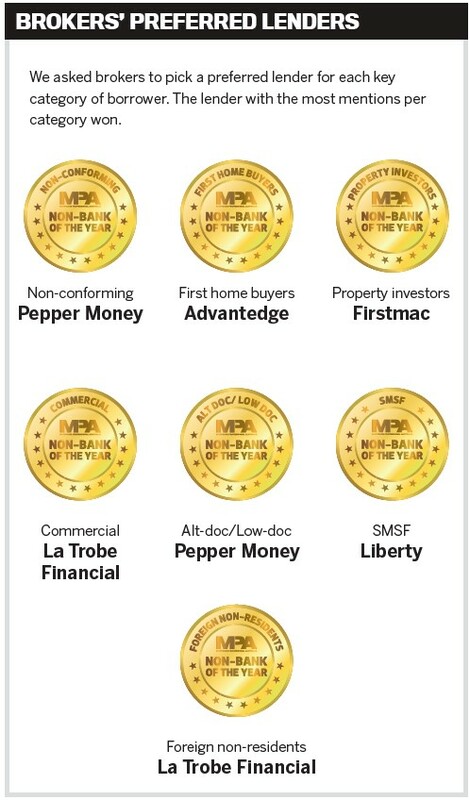 Pepper's recent alternative marketing tools are fantastic,” said a Melbourne broker. Pepper’s Referral Marketing Toolkit, which was downloaded more than 2,500 times in the first week of its release in July, is one such example of a lender making its proposition more appealing to brokers. The feature was developed following broker demand for content and tools that would help them target clients in the nonconforming market. When brokers can properly explain why they’re recommending a non-bank over a bank, it seems that clients are willing to accept the alternative. Ninety per cent of brokers say their customers are typically open to non-bank products. DO TURNAROUND TIMES TRUMP ALL? Turnaround times are one of those things that brokers never stop talking about, and with good reason – they can make or break a deal and future referrals. With the non-banks now seeing a larger amount of loan tra­ffic, turnaround times will naturally blow out, but brokers’ patience will only last for so long. They have to handle an angry customer at the end of it, after all. The lender that is empathetic and quick to remedy this will win brokers’ favour. Forty per cent of brokers said turnaround times had worsened in the last year, while only about a quarter said they had improved. In the latter group, one broker said they had specifically “changed to using banks and nonbanks that have good turnaround times”. Brokers who said turnaround times had worsened chalked it up to the non-banks being unable to handle the added volume; the increase in compliance demands and paperwork; and new and inexperienced staff. A few brokers also said the royal commission had heightened caution among assessors, increasing the number of times deals went back and forth before approval. “ The royal commission is making it harder and harder to earn a reasonable living, with extended and over-the-top new compliance paperwork. Incredibly restrictive servicing calculator figures are strangling and restricting buyers from entering the market, and increasing the amount of clients being declined,” said a broker from Victoria. Interestingly, only one of the non-banks that won in the turnaround times category last year, Firstmac, appeared on this year’s list. The new winner was Advantedge, which has a major bank’s expertise behind it. The lender has also invested heavily in digital enhancements, such as IDyou, ZipID and DocuSign, to expedite the customer identification process and streamline the settlement process. These tools make it quick, easy and convenient for both brokers and customers. They also help ensure that submitted applications achieve the quality, consistency and compliance level that Advantedge is seeking. Surprisingly, Pepper Money, which snapped up gold in every category apart from three and had the most-liked product overall, came in fourth place for turnaround times. Perhaps this suggests that, in some cases, a product that fits right can even trump speed of response. As for commission structures, the vast majority (80%) of brokers said there had been no difference to the last year, while 13% said these had worsened – a slight uptick from last year’s 9%. Bluestone, which is pushing hard into the near prime space, had a strong showing this year, beating some of the bigger players to take the top prize in this category. In light of the royal commission and tightening credit, are the non-banks doing enough to support and stand by the broker channel? ​​​​​MPA: Why do you think brokers were so pleased with Pepper’s service? Broker support: This year we expanded the team that supports brokers, including bolstering our localised, on-the-ground BDMs; increasing our dedicated scenarios team; and hiring more deskbound relationship managers to ensure our partners get the support they need, when they need it. Broker tools: Our Customer Conversion Toolkit has been a runaway success with brokers. More than 3,000 brokers have used the Pepper Product Selector (PPS) tool over 12,500 times this year so far, returning approximately $4bn in indicative o­ffers. It’s particularly useful for customers whose needs may be more difficult to fulfil, saving brokers time by eliminating wasted e­ ort exploring dead-end solutions. Broker education: We’ve invested in a full calendar of events aimed at helping brokers be more comfortable offering alternative solutions. Our fourth national Insights Roadshow this year focused on sharing insights on real-life industry issues and providing access to industry participants experienced in these areas. Feedback from brokers was phenomenal, with brokers rating it one of the best events in the industry. 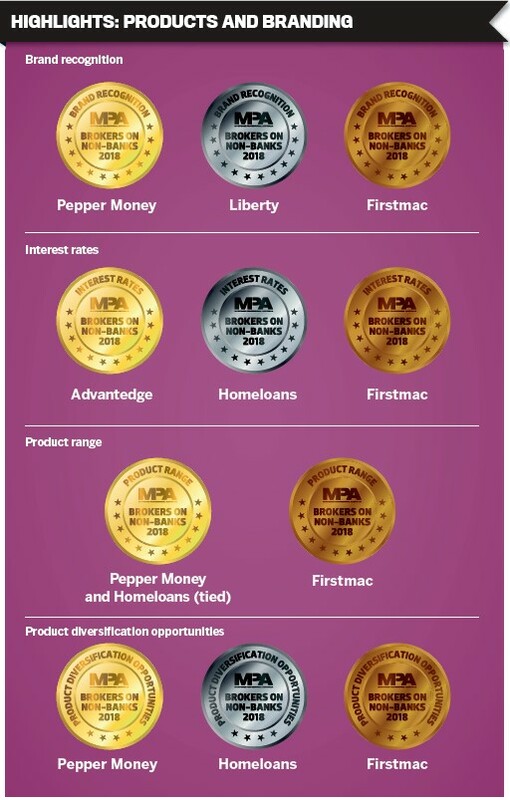 MPA: With all the lending changes and tightening this year, how did Pepper manage to keep its credit policy attractive? MR: Consistency is key. Our ‘can do’ reputation wasn’t built overnight; we have continuously invested in raising awareness and developing our products. This has positioned Pepper as the leader when brokers need certainty. Pepper has had a near prime product for more than six years. When the banks’ credit policies tighten, Pepper’s near prime product o­ffers brokers and their customers a viable solution. At our core, Pepper seeks to help underserved borrowers succeed. When we underwrite a loan, a human assesses the application, which means we look at the borrowers’ individual circumstances before o­ffering a solution. We will automatically reassess an application under our near prime and specialist credit policies where the application doesn’t fi t as prime. This means we’re more likely to be able to provide a solution. MPA: What do you have in the works for brokers next year? MR: With 90% of our volume coming from brokers, we know that we need to continue to listen to brokers and respond to what they want. We’re excited to share that in 2019 we’re considering some bold new asset classes based on their feedback. We’ve also been working with our most loyal PPS users who are assisting us in launching phase two of Pepper Product Selector, which will generate even greater conversion rates for brokers. Pepper Resolve has had fantastic success in pilot groups and we’re excited for this tool to go mainstream next year. We’re continuing our broker education program, which gets bigger and better every year, and we’ll be releasing more tools and content through our Alternative Lending Marketing Toolkit. MPA: Firstmac came in second place this year, marking a significant improvement from last year when it came in fifth. What is behind the improvement? Jake Sanders, head of third party sales: We have worked hard this year to expand our team with the right people and build a true service culture. This means taking a solutions-focused approach to every broker enquiry. We have also emphasised consistency in our policy, service and sta­ff. I am grateful that brokers that have dealt with us are now becoming our advocates. This year, I think we have really found our place in the market competing for prime business. We aim to maintain our momentum in the coming year with the fantastic support of our broker and aggregator network. MPA: Advantedge came in third place and won medals in a number of categories, including gold for turnaround times and interest rates. What changes did you make to set you apart? Brett Halliwell, general manager: We pride ourselves on the superior support and service we provide to all brokers. Part of this includes o­ffering brokers cutting-edge digital tools and giving them direct access to our dedicated scenarios and credit teams. This enables brokers to better deliver for customers and is reflected in the most recent NPS score of +45. The introduction of digital document delivery and signing has greatly reduced turnaround times, while our quality submissions checklist has supported brokers in asking the right questions before submitting loan applications. These improvements have been embraced by brokers, and of course customers. MPA: Last year, Bluestone came in 6th place, so this is a significant improvement. What made the lender so attractive to brokers this year? 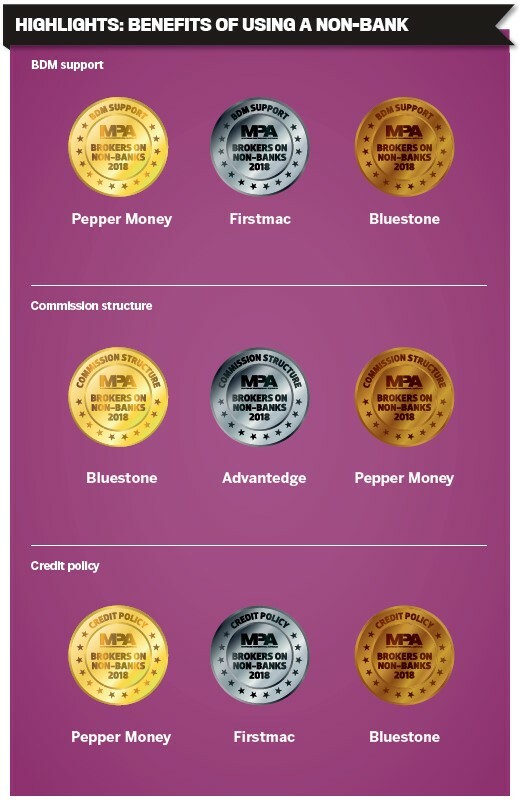 Royden D’Vaz, head of sales and marketing: We're honoured to have picked up five medals across a variety of categories in MPA’s Brokers on Non-Banks survey, including a gold medal for commission structure. 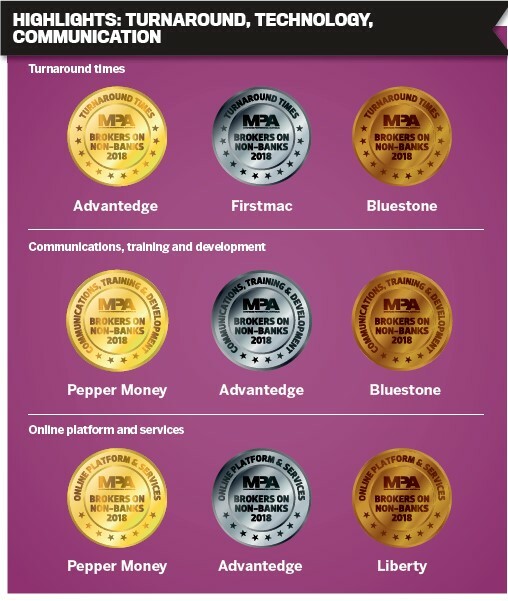 These awards are a testament to the hard work and dedication of the Bluestone team, and further highlight the impact that our new near prime products have made on the market. At a time when more and more borrowers are unable to meet the lending criteria of the mainstream banks, Bluestone is proud to offer solutions which enable borrowers to access loans at competitive rates.